This blog is likely going to piss off some folks, but I feel I have to say it anyway. Actually, I've already said most of this in other blogs and web essays, so this is somewhat redundant, but I continue to grow weary of the same old mythology being repeated endlessly. Storm chasers and real scientists (some of whom are also storm chasers, including me) have something in common. They cling to the myth that they're out in the field to help save lives - that their primary motivation is for the good of society. They risk life and limb while doing so, as recently demonstrated in the most compelling way with the deaths of Tim and Paul Samaras, and Carl Young, as well as one (or possibly more) non-scientist chaser(s) on 31 May 2013. It's a fair question for someone to ask what they died for. Was Tim's really gathering data inside tornadoes in order save lives? Does that really justify the risks that Tim took to obtain his unprecedented observations? In some long-term perspective, it might be that somewhere down the road, the data that Tim obtained might help fill a gap that will somehow lead to saving lives. I certainly can't rule out that possibility. Tim's observations are so pioneering, at this point in the history of tornado science, it's really hard to say just what impact the data might eventually have. Saying that his work was directly tied to life-saving is, in my opinion, simply not justified. His work was tied to a single element of a complicated topic - tornadoes - that might someday lead to an improved understanding of internal tornado dynamics, and so is important in the way that all basic science is important. We're pushing forward the frontiers of our understanding, certainly. But a greater understanding of tornado dynamics doesn't do anything to save lives at present. Why do I make such a statement? Let me summarize as briefly as possible where I believe we stand when it comes to saving lives. Since 1925, the fatality rates from tornadoes have been declining pretty steadily. This is, I believe, the result of several factors, including growing public awareness, the development of infrastructure to spread tornado warnings ahead of dangerous storms, the re-emergence of tornado forecasting in the late 1940s, and probably a number of things I should have mentioned but have not, perhaps out of ignorance but certainly in the interest of brevity. Tornado science in the USA began to be serious as a direct result of the resumption of tornado forecasting - the basic science originally was being driven by a need to learn more about how to forecast tornadoes. That basic research now has a life of its own, mostly independent of forecasting needs. 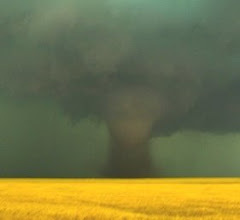 But tornado scientists still feel obligated to say their research, no matter how abstract or unconnected to the real world it might be, is justified because of its potential to save lives. They may even believe that to be the case - but I don't. As it stands right now, most tornado fatalities are the result of long-track violent tornadoes that hit populated areas. For such storms, virtually all of which are associated with supercells, the forecasts and the warnings are already pretty darned good. Not many people are dying in tornadoes for the lack of adequate warnings. The warning lead times for long-track violent tornadoes average much larger than for lesser events that are much less likely to cause multiple fatalities. I've estimated that since the mid-1950s, the NWS outlook/watch/warning system is responsible for saving perhaps 10,000 lives. Yes, the system isn't perfect and there are many things we can and should do to improve it. Nevertheless, it's neither the absence of warnings nor the inadequacy of lead times that cause by far the majority of most deaths in tornadoes today! People still are dying when violent tornadoes hit populated areas because, for one thing, most of the people in the tornado-prone areas have nowhere to go for adequate shelter from such a violent tornado. Basements are good, but not adequate by themselves, and many American homes have no basements. Typical frame home construction in the US is pathetically flimsy, even when built to code. The structural integrity of most homes in the plains is limited to winds of 90 mph or less, when built to code. Sadly, building codes are widely violated, even in expensive homes, reducing their structural integrity still more. Flying debris from flimsy homes add to the fatality counts. More than half of the annual tornado fatalities are now tied to mobile homes. Poor people can't afford even a flimsy frame home and so mobile homes are a cheap way to have the American dream at an affordable cost - until they're in the path of a tornado! And many people have done little or nothing to prepare for a tornado; they don't even have a proper plan for what to do at home or at school/work. Very few scientists do their research specifically to save lives. They do it because they love what they do! It may ultimately be practical, but that's not why they do what they do in the here and now. Storm chasers don't chase to save lives. They do it because of a passion for storms! Tim Samaras was a scientist/engineer and a storm chaser. I know and understand his real motivations better than most people, not just because we were friends but because I have the same motivations, and I honor his memory in no small part because he was doing what he loved. Tim wasn't really doing it to save lives. And neither are virtually all the other scientists and storm chasers. If what they do might eventually lead to saving lives - and they choose to spend some extra time and effort specifically for doing that - I'm confident they'll have a right to feel good about that. My friend Al Moller helped me to find ways to give some of what I'd learned in my chasing and in my research back to the National Weather Service and to the many storm spotters whose real role is to save lives. I do feel proud that I learned how to do that with Al's help and I choose to believe that some lives indeed were spared through our efforts. But saving lives wasn't why I became a scientist and a storm chaser. It's time to put that myth to rest and be honest with ourselves and the public! Dr. Doswell, at the end of this blog entry you talk about giving back to the NWS. I think this is a good time to say thank you for giving back directly to the public in the form of your rock solid essays on severe weather. I believe that anyone who takes the time to read your essays is very unlikely to be injured or killed by severe weather, be it tornadoes, flash floods, lightning, etc. I find your essays on dealing with severe weather to be interesting, though provoking, and practical. Unfortunately, it's not possible to put a number on the number of people who avoided death or injury as a result of reading and heeding your advice. Thank you for your essays and for making yourself available to answer questions. I'd like to see you release your essays in book form or write a book with the same rock solid advice. Best wishes and I hope you have a good rest of the summer. There are many reasons people use the "I'm saving lives" phrase. For some it's to distinguish themselves from the "thrill seekers" or to legitimize their activities (both to themselves and to others) during what are undeniably the most stressful moments in the lives of the victims. For others it's simply to gain access to restricted areas (bypass police roadblocks) through loose association with emergency responder activities. While a chaser running SpotterNetwork is "technically" part of a system designed to help save lives one has to question the chaser's true intentions when he's also shooting and selling video, promoting a website or business, and soliciting interviews on national media. As George Hrabovsky pointed out a spotter's first priority is to help their community and save lives. Following Reed Timmer's tornado encounter at Yazoo City several years ago there was a noticeable shift in the way chasers were portrayed on the popular TV series Storm Chasers. Deliberate and somewhat out of place cameos were inserted into each episode showing the cast explaining how they are out to save lives. This was the direct result of negative viewer comments about Discovery profiting from the suffering of others and designed to counter the increasingly poor image of chasers in general. As is often the case, what's seen on TV is emulated (sometimes word for word) by disciples of the show when it's their turn to be interviewed. If you're chasing because you simply enjoy storms or the thrill of the hunt then more power to you but don't claim to be conducting scientific research or out saving lives when you're actually doing neither. Scott - thanks for your kind comments. Do you know you sent me six copies of your comments? Chuck, re your comments: "Very few scientists do their research specifically to save lives... Tim wasn't really doing it to save lives. And neither are virtually all the other scientists and storm chasers." "Our job in life is to make things better for those who follow us." Richardson certainly integrated public service into his life and work, sometimes to his own professional detriment--most clearly by quitting his observatory post to serve as an ambulance driver in WWI France, with bullets and shells whizzing around. He was there because he was a Quaker and chose to alleviate suffering. And yet, his book was published, and it later transformed weather forecasting. Richardson later chose to abandon meteorology when he saw his turbulence research applied to war, and instead pioneered research in what is now known as peace studies. Richardson is the exception, of course. But perhaps it would be better if we viewed him as an example to live up to, rather than as an exception to the rule of self-interest. Sometimes, I feel ashamed of my gender! The 'Crockumentary' Beat Goes On ..